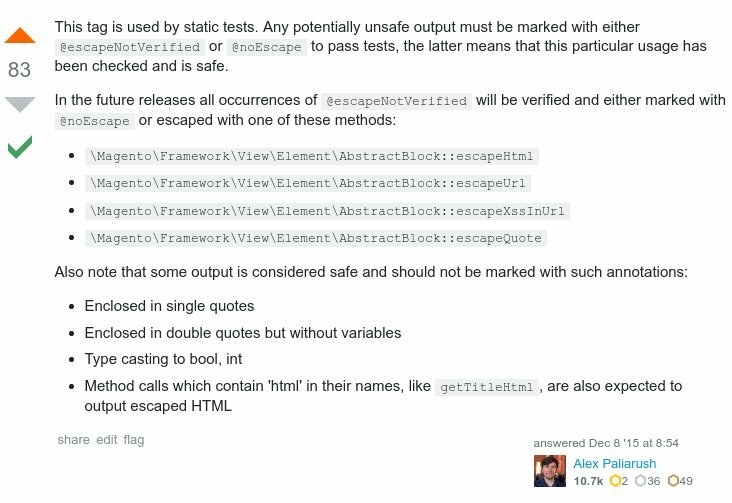 Did you ever wonder, what @escapeNotVerified is doing all over the place in Magento templates? I’ve often seen it blindly copied from core code. Don’t do this! Historically, when Magento introduced a code sniffer rule to detect unescaped output in templates, they automatically added the @escapeNotVerified annotation to all unescaped output because it could not be handled all at once. The code sniffer ignores those. They serve as a TODO and it was intended to go through them over time and either add the missing escaping or replace the annotation with @noEscape instead. JSON in scripts is the only case where escaping actually does harm; in other cases, it just has nothing to do. So if in doubt, rather escape any output. But use the right method! And if you want to output actual HTML, the guidelines say it should come from a method with “Html” suffix, e.g. getButtonHtml() – the code sniffer does not complain about missing escaping in that case. A debatable case is when core templates are overridden in a custom theme to make modifications. At this point you take ownership of the code, so ideally you should review the unescaped output and take the appropiate action. But sometimes the templates are large and the modifications small. Fixing the original code may seem like a waste of time and then you lose the ability to diff the own template against the original one and easily see the modifications. So it is a trade-off and I often pragmatically let these cases pass during code reviews. So I counted the occurences in every release since 2.1.0 and plotted them over time. You’ll notice that 2.2.0 and 2.1.9 in September 2017 were the last releases with significant reduce. Why this? Did Magento lose interest in the rather boring, but important, verification task? 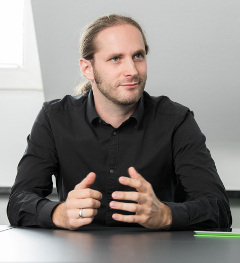 But there is good news: Magento works hard on a new code sniffer that will be used for core and extensions (magento/magento-coding-standard) and from what I’ve heard, new rules will only be applied to new code, so that something like the introduction of @escapeNotVerified will never happen again. But Lena Orobei of the Magento Marketplace Extension Quality Program pointed out that in the core there are currently two tools that check missing escaping in templates. Not only the code sniffer, but also a static test, implemented in PHPUnit, XssOutputValidator, which still allows @escapeNotVerified. The good thing about this additional tool is that it does not respect @codingStandardsIgnoreFile annotations which are often found in templates. 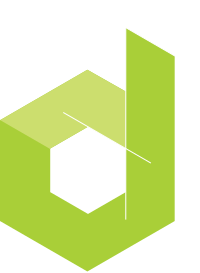 A potential disadvantage is that it may often not be part of the QA tooling for implementation projects or third party extensions. The code sniffer rule may be dropped for that reason (see issue on Github), so as of January 2019 and Magento 2.3.0, all is still in motion. 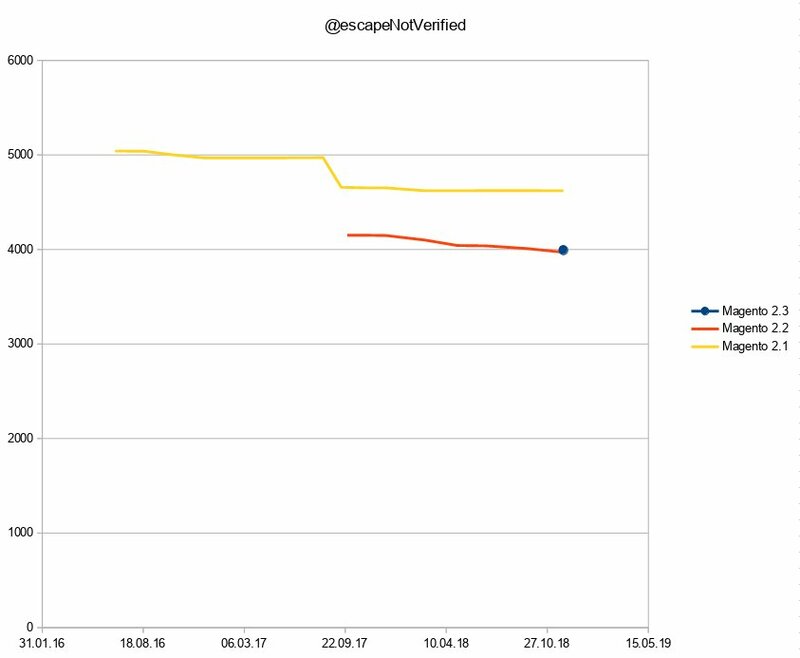 Never use @escapeNotVerified, it was a temporary workaround for core code and there are efforts to remove it. Instead, use the appropiate escaping methods for the context (e.g.  HTML element or HTML attribute), or fall back to @noEscape if the output is supposed to be HTML and cannot be retrieved with a method that ends with “Html”.